Swamp Shark: Buffy grows up, beats up shark. This very recent production, 2010, was actually a bit of a surprise package. 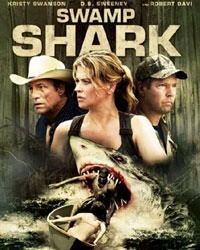 Titles like ‘Swamp Shark’ are normally the exclusive reserve of the Z movies and Zero casts. Yet here we find two of the cast have had past opportunities most actors would grasp and run with. Not the awesome awfulness we were expecting! The principle is well worked: local Small Town (tm) community threatened by monster in the water as ‘water themed festival‘ is about to begin. Ok, it’s been done to death, and with sharks. A lot. Here we have some minor tweaks (Swamp, something’s eating the alligators, armoured shark…) but nothing truly original. And that makes writing a review tricky. The movie, especially for a TVM, isn’t all that bad. Yes the plot is ‘well trod’, yes the supporting cast is dire, and there is little evidence of direction. But the armoured shark ain’t badly rendered, and unlike Monster actually appears, and the ‘veteran’ cast is watchable. Kristy Swanson seemed in the ’80 and ’90 to have sussed it. Few leads but an impressive CV – ‘Pretty in Pink’, ‘Ferris Bueller’s Day Off’, ‘Flowers in the Attic’, ‘Hot Shots!’ – led to the real break ‘Buffy the Vampire Slayer’ and even in the potential blockbuster ‘The Phantom’. But after that the CV doesn’t dry up but sort of, well, pan. Here she is asked to carry the movie and it sort of nearly works, might of too if the rest of the cast had been, well, not entirely comprised of oak. The exception is Robert Davi – best know as one of the Agent Johnson’s in ‘Die Hard’, James Bond’s chief henchman adversary in ‘Licence to Kill’, the club owner in ‘Showgirls’. A long career of hard men though shows the man can carry a role and does so here – quietly and simply. The rest of the cast leave you not caring at all whether they live or die. Perhaps. Mild interest in the order of the munching. Possibly looking for each of the horror movie stereo types. Maybe cheer on the shark ad each victim is partially devoured. A special note has to be given for Richard Tanne, who completely ruins many a scene single handedly playing the leads boyfriend. How? Well, the poor Jake Gyllenhaal impersonator, hardly seems able to vocalise the lines. Acting is secondary even to that. Doesn’t help that he’s 17 years younger than Swanson. The one thing that I dreaded about the movie was how they’d approach rendering the shark. A true SciFi (or is that SyFy – lol) concept, an armoured shark must have been a tricky one. On the whole they do quite well here. Clear, crisp shots from the out n’ out, none of the normal hints and tips and mangled corpses piling up. Nope. Armoured shark is blamed outright, straight away. Don’t get me wrong, you aren’t gonna watch Swamp Shark and believe they found a real armoured shark but it’s good enough. Good effort. Poor secondary cast reduces the overall effect dramatically. As does the lack of effective direction. I don’t think we’ll see much more of Mr Tanne. Hopefully.